I had the chance to see W./E. a week and a half ago and it was worth the trip to Manhattan on a rainy Thursday night. 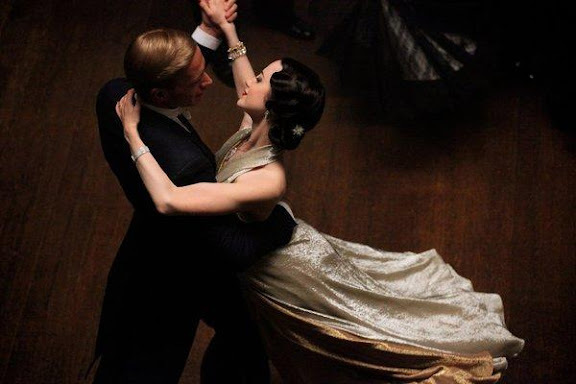 The film, directed and co-written by Madonna, is about two love stories, one of Wallis Simpson and King Edward VIII, whose romance resulted in Edward famously abdicating the British throne to marry the twice-divorced American. The other is of Wally Winthrop, a young New Yorker unhappy in her marriage who becomes fixated on the story of Wallis and Edward upon the occasion of the Sotheby’s auction of their estate. Oscar Issac as Evgeni, the very handsome Sotheby’s security guard, Abbie Cornish as Wally Winthrop. I adore this patterned blouse on her. I loved the actors, the story, the beyond-glorious costumes, the cinematography, the sets, and the music. Oh wait, that’s pretty much everything. I was a little worried during the opening scenes when there was a lot of grainy handheld camera work—which took me out of the moment, every time—but after that (mostly) went away I settled in for a bittersweet romance, times two. The movie has sparked in me a curiosity about the Duchess of Windsor—which, okay, was already growing after my trip to Cartier in January, and a look through my mother’s copies of the 1997 Sotheby’s auction catalogs of the Duke and Duchess of Windsor’s estate—so stand by for further missives on this topic, because I feel a mild obsession coming on. James D’Arcy as Edward, Andrea Riseborough as Wallis in a still from W./E. Do not even get me started on this gorgeous gold lamé dress or the jewels in her hair! I love this ladylike look! And now I want a Lady Dior handbag, which Abbie carries here. When I saw this suit onscreen I actually gasped in the theater, it is that beautiful. Photo by Tom Munro. If you’d like to visit the movie’s website, which includes a trailer, click here. Thanks for the review...now I really want to see it!! Oh, you make me want to see this film. I wonder how soon it will come to KC. Wonder if that suit is Mainbocher. I understand he designed many of Simpson's clothes.